Here’s how we get more than 66 million pounds of food per year to the people who need it most. 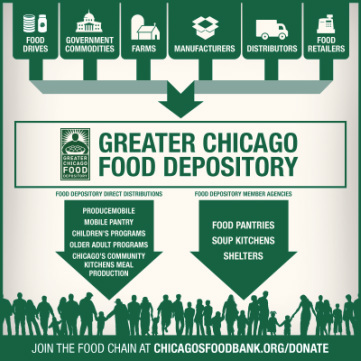 Most of our product donations come from more than 350 local and national food companies, grocers, foodservice organizations, produce markets and growers that find a convenient, safe and reliable way to channel food to us that might otherwise go to waste. Roughly 700 food drives are sponsored each year by local business, professional and community organizations, schools and churches. All food donations are inspected, sorted, repacked and labeled for distribution to agencies by volunteers and employees who operate out of our food bank and training center. Member agencies arrive at the Food Depository every weekday to pick up food they have ordered. In addition, we employ a fleet of climate-controlled vehicles that help pick up and distribute food throughout Cook County.